To find maps, where to stay, reviews, and more tourist information, read Los Angeles planner . Brisbane, Australia to Los Angeles is an approximately 16-hour flight. You can also do a combination of flight and train. The time zone changes from Australian Eastern Standard Time (Queensland) to Pacific Standard Time, which is usually a -18 hour difference. Expect somewhat warmer temperatures when traveling from Brisbane in September; daily highs in Los Angeles reach 34°C and lows reach 22°C. You'll set off for Las Vegas on the 2nd (Mon). Do some cultural sightseeing at The Strip and Pinball Hall of Fame. Escape the urban bustle at Red Rock Canyon National Conservation Area and Lake Mead National Recreation Area. When in Las Vegas, make a side trip to see Willow Beach in Fort Mohave, approximately 1h 10 min away. It doesn't end there: examine the collection at The Mob Museum and admire the local landmark of Bellagio Fountains. For more things to do, other places to visit, and tourist information, refer to the Las Vegas vacation builder app . You can fly from Los Angeles to Las Vegas in 4 hours. Other options are to drive; or take a bus. Traveling from Los Angeles in September, expect nights in Las Vegas to be about the same, around 25°C, while days are a bit warmer, around 39°C. Cap off your sightseeing on the 5th (Thu) early enough to travel to Dallas. Kick off your visit on the 5th (Thu): steep yourself in history at Fort Worth Stockyards National Historic District, then wander the streets of Sundance Square, and then take in panoramic vistas at Reunion Tower. For reviews, other places to visit, traveler tips, and other tourist information, go to the Dallas trip planning tool . Traveling by flight from Las Vegas to Dallas takes 6 hours. Alternatively, you can drive; or take a bus. Due to the time zone difference, you'll lose 2 hours traveling from Las Vegas to Dallas. Expect a daytime high around 39°C in September, and nighttime lows around 26°C. Wrap up your sightseeing by early afternoon on the 6th (Fri) to allow enough time to travel to Houston. For reviews, traveler tips, maps, and more tourist information, read our Houston trip planner . Traveling by flight from Dallas to Houston takes 4 hours. Alternatively, you can drive; or take a bus. Expect a daytime high around 38°C in September, and nighttime lows around 28°C. You will leave for New Orleans on the 7th (Sat). 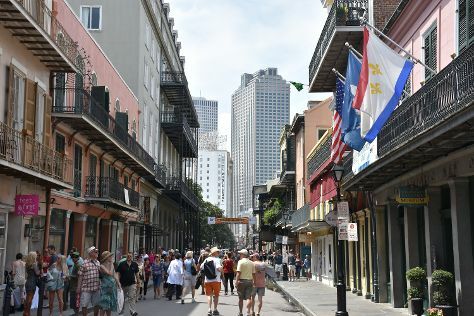 Kick off your visit on the 7th (Sat): learn about all things military at The National WWII Museum and then take a stroll through Royal Street. Get ready for a full day of sightseeing on the next day: get to know the fascinating history of Garden District, go for a charming ride with a horse-drawn carriage tour, contemplate in the serene atmosphere at St. Louis Cathedral, then look for gifts at Faulkner House Books, and finally don't miss a visit to Jackson Square. To find reviews, photos, where to stay, and tourist information, refer to the New Orleans trip itinerary planner . You can fly from Houston to New Orleans in 4 hours. Alternatively, you can do a combination of flight and car; or drive. Expect slightly colder weather when traveling from Houston in September: highs in New Orleans hover around 33°C, while lows dip to 33°C. Finish your sightseeing early on the 9th (Mon) so you can drive to Memphis. The largest city on the Mississippi River, Memphis bills itself as both the "Birthplace of Rock" and "Home of the Blues." With such a rich musical heritage, it shouldn't come as a surprise that Elvis Presley chose to live in Memphis during his later years. Kick off your visit on the 9th (Mon): steep yourself in history at Sun Studio, pause for some photo ops at National Civil Rights Museum - Lorraine Motel, then appreciate the extensive heritage of Beale Street, and finally look for gifts at Memphis Music. Get ready for a full day of sightseeing on the 10th (Tue): stroll through Memphis Zoo, then try to win big at Horseshoe Casino, and then make a trip to The Peabody Ducks. Plan a Memphis trip in moments using our itinerary builder. Traveling by car from New Orleans to Memphis takes 7 hours. Alternatively, you can fly; or take a train. Traveling from New Orleans in September, Memphis is a bit cooler at night with lows of 23°C. Wrap up your sightseeing on the 11th (Wed) to allow time to drive to Nashville. Let the collections at Lotz House Museum and Country Music Hall of Fame and Museum capture your imagination. Do some cultural sightseeing at Downtown Nashville and Andrew Jackson's Hermitage. Get out of town with these interesting Nashville side-trips: David Arms Gallery (in Franklin) and Bowie Nature Park (in Fairview). The adventure continues: get engrossed in the history at The Johnny Cash Museum & Cafe, stroll through Centennial Park, examine the collection at RCA Studio B, and appreciate the extensive heritage of Bicentennial Capitol Mall State Park. Find out how to plan Nashville trip without stress by asking Inspirock to help create an itinerary. Drive from Memphis to Nashville in 3.5 hours. Alternatively, you can take a bus; or fly. Traveling from Memphis in September, Nashville is a bit cooler at night with lows of 19°C. Cap off your sightseeing on the 13th (Fri) early enough to travel to Washington DC. Start off your visit on the 14th (Sat): contemplate in the serene atmosphere at Washington National Cathedral, stroll the grounds of Arlington National Cemetery, and then examine the collection at National Air and Space Museum. To find maps, where to stay, reviews, and tourist information, go to the Washington DC visit planner. Traveling by flight from Nashville to Washington DC takes 4.5 hours. Alternatively, you can do a combination of flight and train; or drive. The time zone changes from Central Standard Time (CST) to Eastern Standard Time (EST), which is usually a 1 hour difference. In September, plan for daily highs up to 32°C, and evening lows to 21°C. Cap off your sightseeing on the 15th (Sun) early enough to travel to New York City. Do some cultural sightseeing at The Metropolitan Museum of Art and Times Square. Step out of the city life by going to Edwin B. Forsythe National Wildlife Refuge and Point Lookout Beach. Get out of town with these interesting New York City side-trips: 8th Ave Jetty (in Asbury Park), Bronx Zoo (in Bronx) and Cupsogue Beach County Park (in Westhampton Beach). There's much more to do: pause for some photo ops at 9/11 Memorial, hunt for treasures at Chelsea Market, meet the residents at Central Park Zoo, and wander the streets of Fifth Avenue. For traveler tips, ratings, where to stay, and tourist information, you can read our New York City online trip planner . Traveling by flight from Washington DC to New York City takes 3.5 hours. Alternatively, you can take a train; or drive. In September, daytime highs in New York City are 31°C, while nighttime lows are 22°C. Cap off your sightseeing on the 19th (Thu) early enough to travel to San Francisco. Use Inspirock's suggestions to plan your San Francisco trip and find the best activities and attractions for your vacation. Do a combination of bus and flight from New York City to San Francisco in 9 hours. Alternatively, you can fly; or drive. Due to the time zone difference, you'll gain 3 hours traveling from New York City to San Francisco. Traveling from New York City in September, San Francisco is a bit cooler at night with lows of 17°C. On the 20th (Fri), you're off toSan Simeon. When you arrive in tiny San Simeon, which lies halfway between San Francisco and Los Angeles, you can see why William Randolph Hearst chose this coastal locale for his famous hilltop castle. Start off your visit on the 20th (Fri): step into the grandiose world of Hearst Castle and then look for all kinds of wild species at Elephant Seal Rookery. On the 21st (Sat), you'll have a packed day of sightseeing: kick back and relax at Piedras Blancas, examine the collection at Coastal Discovery Center at San Simeon Bay (Monterey Bay National Marine Sanctuary), and then enjoy the sand and surf at Moonstone Beach. To see photos, reviews, ratings, and more tourist information, go to the San Simeon trip planner . You can drive from San Francisco to San Simeon in 4.5 hours. Other options are to take a train; or do a combination of flight and bus. When traveling from San Francisco in September, plan for a bit warmer days and slightly colder nights in San Simeon: temperatures range from 38°C by day to 13°C at night. Finish your sightseeing early on the 21st (Sat) so you can drive to Los Angeles. On the 22nd (Sun), take a stroll through Rodeo Drive, make a trip to Melrose Avenue, browse the eclectic array of goods at Melrose Trading Post, then appreciate the history behind Guitar Center, and finally look and learn at Griffith Observatory. For more things to do, traveler tips, maps, and tourist information, use the Los Angeles online trip itinerary builder . Getting from San Simeon to Los Angeles by car takes about 4.5 hours. Other options: do a combination of bus and flight; or do a combination of bus and train. Traveling from San Simeon in September, expect nights in Los Angeles to be a bit warmer, around 22°C, while days are a bit cooler, around 34°C. On the 23rd (Mon), you'll travel back home.